Halfway through the year and I’d hoped to be able to report the successful, trouble-free completion of the footings for the new toilet and store. No such luck as the reported underground mains electric cable problem is going to take 3 months or more to resolve and at our expense. The remaining parts of the project are at least well underway and the poor old gas house is looking cared for once more, even in its incomplete state. Once again local history turns up in its usual unexpected way and maybe partly because of my incessant ramblings on local history over the past years. The upshot was a large collection of family postcards and photographs both family portraits and those of many un-named soldiers, rescued from disposal by James Neal after his grandmother Brenda Slaughter died. There are many unidentified items that could have come from any of her forbears or other locals . Some local names are present which includes the names of Butcher, Bradley, Bone, Curson, Beck, Tash….. and there are others. The collection of postcards has been the clue to at least some of the puzzle as many were connected with the Bone family, i.e. James Neal’s great-great grandmother’s family. These were sent home during WW1 by Edward Charles “Ted” Bone, James’ great-great uncle. He is the second name on the Roll of Honour in the church and was mentioned on 3 separate occasions in the Parish Magazine during the War. From his signature and comments on the reverse both cards and a photo it has been possible to identify him from the large collection of WW1 soldier’s photos. Likewise from a series of postcards sent, to and from Ted’s sister Violet, to husband to be, Maurice William “Mark” Butcher (James’ great grandparents), we can identify Mark Butcher in his uniform as an Army Service Corps butcher (yes, by name and nature!). Another series of postcards written to Ted in 1915 by “Mary” hint at a romance that, as far as I can tell, was never realised. A possible candidate for “Mary” is Mary Louise Beck from Fakenham, the addressee on 2 of the postcards, though not from Ted. She was the daughter of George Beck the flour manager at the Mill on the Bridge and was working as a waitress according to the 1911 Census. She never married and died at Cranmer House in 1981. Among the soldiers pictures a photocard of Private Francis Bates on horseback was signed and sent to Ted’s mother from Cairo in 1915, “with every good wish”. He was a Bucks Yeomanry/Hussar and it is most likely that he was billeted with the Bone’s in Ted’s absence. There were also two items with a Sennowe connection, one a postcard to F. “Punch” Myhill, Sennowe Park Ryburgh from Eileen O’Byrne and the other, a wonderful photocard of three men, believed to be the coachmen to Thomas Albert Cook, taken in a corner of the stable yard before WW1 and far more than a lifetime away! Unfortunately, I have not found any trace of Ted beyond these dates and further research only throws up one matching person’s death, registered in Holborn in 1960. Nevertheless, it is the sort of source material that one always hopes to come across and in this case it has certainly come up trumps! At last things are beginning to happen on the Glebe field where the new toilet, stores and car parking for the Church are to be developed. The poor old Gas House itself is in a sorry state but work has begun to stabilise the structure that has included the grinding down of the large ash stump on the southwest corner and the removal of quantities of its offspring from the east gable wall that had already created a large network of roots and suckers. It is a case of taking down the masonry to a stable point and then carefully reconstructing ready to take new wall-plates and roof timbers. As for the new work, there is an existing drain of some age, perhaps 100 or more years old heading towards the ditch-work that borders the field and which we hope might be able to take the rain-water from the new building. This has to be further investigated and unfortunately the costs of clearing and surveying it are quite high and it may be cheaper to put in something entirely new. We have just found out that there is an underground electricity cable that runs under where the new building is to stand and so we have yet to be told what is expected of us by way of protecting the cable through the footings. The whole site looks far more business-like now with its enclosing site fencing. The stock-proof fencing required by the Glebe to enclose the car-parking area should be in place by the time you read this and later in the year, the native species hedging required by the local planners will be planted. Good news though, there are now sufficient funds available to be able to make a start in the ground, which is just waiting on the final detailed approvals from the District Council Planners. The Faculty for the creation of the new churchyard entrance and pathway has been approved so there is plenty to get on with in the meantime. 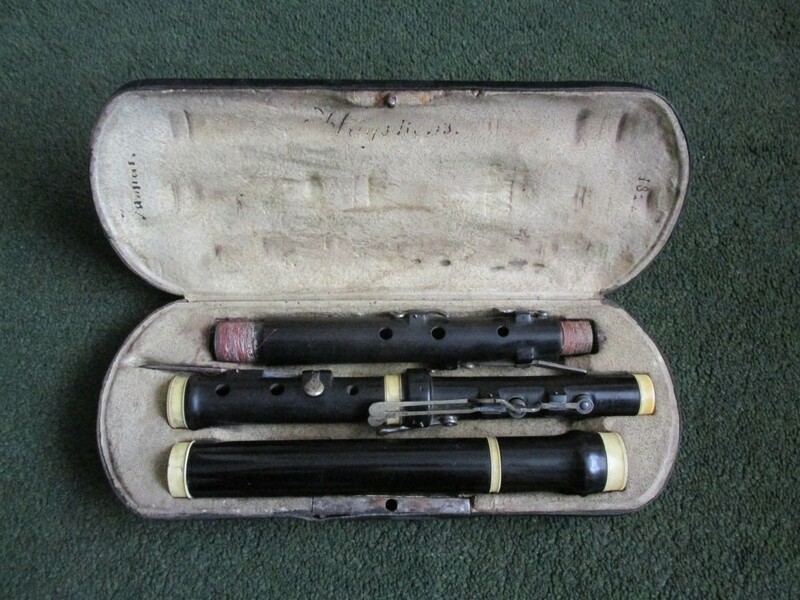 A rare 19thCentury flute that was donated after being found in an inherited chest of drawers realised £1000 early in the fundraising which helped to pay for the initial expenses and since then, kind-hearted people continue to find items to use in the build or sell to boost funds. The flute, made in Vienna by Stephan Koch in 1822 one of the top makers of the day, represents an important stage in the development of the modern flute and was purchased by a Canadian flute maker and restorer. A wind-up HMV Model 109 gramophone which was sold to Australia and a companion collection of jazz and swing 78’s that found a new home in Horningtoft raised £130. Most recently, a fine pair of double doors for use or sale “with proceeds to“ have come our way. Our thanks go out to these people and those who keep on coming up with flint, the stuff of which this building will be constructed. There is even a use for the old North Transept gable copings that have just been renewed which probably will become flooring in the Gas House. I will keep the website up to date with progress and keep you posted by this column. It was a phone call from John Savory at Centre Farm Gateley that recently set me on the trail of WW1 casualties from that village. They have no War Memorial and John was not sure if there were any casualties so I said I’d take a look for him. Due to the transient nature of the employment of “Ag Labs” at this time it is not surprising that though a number of serving soldiers were born in Gateley, they or their families had moved from the village. So far I can only find 1 soldier new to me who was born in Gateley. His name was Charles Winn and he died on 25th September 1916. He spent most of his life in Dunton and Sculthorpe and it is at St. Peter's Dunton on their War Memorial that he is commemorated. Another casualty, with connections to Gateley and Ryburgh, was young Charles Henry Hall born in Foxley and whose father farmed for a decade or so from 1902 at Gateley Hill Farm. However, by the end of the conflict the family was to be found at Hill House in Great Walsingham. It is on the Memorial there that his name is to be found inscribed. I knew that Ryburgh’s Walter Betts who died in November 1917 was born in Gateley as was his brother, Ernest Betts who although wounded, survived. Searching for the Betts surname had found others of that ilk. William John Betts, who lived on the Common, fought and received a gunshot wound to the head but survived and was discharged January 1919. Thomas Henry Betts who worked on the railways, son of John and Elizabeth Betts of Gateley Green enlisted in Edmonton. Gateley born Charles King enlisted with the Northumberland Fusiliers in 1905 and served mostly in India until 1913 when he joined the reserve only to be called up for the British Expeditionary Force in August 1914 right at the start of the War. He only remained in France for 2 months and returned on home service until 1916 when he was discharged medically unfit. Alfred Easterwas another with a similar “regular” background who served with the 1stNorfolks in India in the 1890’s and re-enlisted in 1914 to serve with the Labour Corps. This is undoubtedly an incomplete list, but it is a start. At the start of our research into Ryburgh soldiers we had already “adopted Charles Henry Hall as he had attended the village school from 1902 to 1911 and the Picture Norfolk archive had a photograph of him and were willing to let us make use of it on the website. He is remembered on April 22ndas one of 3 Ryburgh casualties of that month in 1918 along with Scotsman Charles Smith MacDonald, (April 20th. )who was married to Ryburgh girl Lily Doy and Little Snoring born John Frederick Bacon (April 18th.) who died of wounds in the German POW Camp Hospital in Kassell. I don’t often get political but in the light of the recent 100th anniversary of the Representation of the People Act (6th February 1918) it occurred to me to investigate what, if anything Ryburgh had to do with the Suffragette movement. A trawl of the British Newspaper Archive produced no results at all specific to Ryburgh, so I widened the search to “Norfolk” which produced copious amounts of small-ad. references to property in Norfolk Square but a few others of local interest. None of these however emanated from our local press however but from “The Suffragette” newspaper itself. 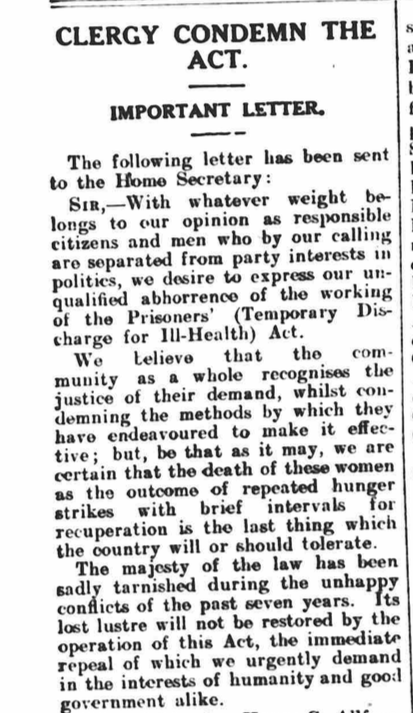 The first references were to the support by some local clergy, signatories to a letter sent to the Home Secretary expressing “unqualified abhorrence of the working of the Prisoners (Temporary Discharge for Ill-Health) Act”. Incumbents of Hunstanton, Lt. Plumstead, Edgefield, Sustead, Acle and Stibbard/Guist joined with clergy across the nation to protest in August 1913. I was pleased to see Stibbard's own Revd. Anthony Fenn (who has appeared before in these pages in his role as Chaplain to the Forces in WW1) making a stand. What a shame that Ryburgh’s F.H.Tatham didn’t share his views (at least not publicly!). A Sermon preached by the Rev. E. H. Taylor, in Sustead Church, Norfolk, on Sunday, August 10, 1913. “The Kingdom of Heaven suffereth violence and the violent take it by force.” Matt.xi,12. Every great reform that has ever come into the world has come by the power of the sword, corruption has been driven from the kingdom by the violent who have taken it by force. It has always been so. When the Jewish State became corrupt, and rulers made profit out of her corruption, the Prophets came; when the Jewish Church became corrupt, and priests made profit out of her corruption, Jesus came; in later days when States and Churches became corrupt, Reformers and Revivalists came, violent men, all of them, who by their violence expelled the corruption. It has always been so, and it always must be so, because the entrance of any great reforms necessitates a condition of warfare, it raises a standard which divides those who fight under it from those who fight against it. You know the conditions of warfare. First there are the standard-bearers leading the attack, they are the heroes, the superhuman men of history, men like Jesus and the Prophets. Then come their followers who win victory through the life and enthusiasm they have inspired. After the victory there is the fury of the defeated foe, of which we had an instance the other day when the Turks in their fight perpetrated atrocities upon every woman they could find. Such are the conditions of warfare, and they are being reproduced now in all their grim reality in what is called the woman’s war. For years past we have been gradually reaching a point where some entirely new force would be needed to drive out the corruption of our social life, to day the force has appeared, and so deeply rooted has this corruption become, that, unless the two sections of the community, the male and the female, join hands, it can never be expelled. Women are the standard-bearers of this new force, and the battle is raging between between those who fight under it and those who fight against it. Will this new force win? In my opinion it has won already, and the sufferings inflicted on the standard-bearers are due to the fury of the defeated foe. I doubt if the standard-bearers of any cause have had to endure more violent and virulent opposition.Note the forces that have been out against them. First there are the politicians. That this is no question of mere party politics is seen by the fact that, while one party has done its worst against them, the other party has stood by without a protest. Yes I must say that if the Conservative Party had been in power it would not have done the things that have been done. It would not have done them because it would not have dared to. Had it attempted even half of what the Liberal Party has done, every Liberal politician and every Liberal newspaper would have denounced it with all the eloquence they could command. Liberals advocate liberty when in Opposition, however much they may violate its principles when in power. No: this is no question of mere party politics. The truth is that the men of both parties know the standard-bearers of this force are bringing in a new order of things, which is to regenerate our political and social life. We have no great men in our political world to-day, no men, that is, of high integrity and lofty ideals. The men we have are little men, with the moral defects of little men. When mrs. pankhurst declared that the reason why the Government had attempted to suppress the SUFFRAGETTE newspaper was not because it had advocated militancy, but because it had pointed out the kind of legislation devised by the White Slave Traffic Act was futile – that effective legislation had first of all to deal with the customers, and that the first people to whom you must apply the Act were the members of the Government itself – you can easily see why it is that the standard-bearers of this new force have been treated by the men of our political world in the way they have. They – the leaders of Society – have been against the standard-bearers. Of course they have. Could it be otherwise? Mrs Pankhurst’s words explain the reason. Combined with these two forces against them there has been the force of the daily Press. All these women have said, all they have done, has been misrepresented and distorted. Surely what has been called the mendax infama of the Press has never sunk to a lower depth. But you know the reason. We have no free Press in England to-day. The Press to-day is governed by the political and social world, by the capitalist and financier, and its editors have to do what they are paid to do. Last of all, the standard-bearers have had the Church against them. Here and there a few individual ministers may have come out in their defence. But what of that? The Church as a whole has not. Again you know the reason. An Established Church dare not go out against the leaders of the political and social world: her bishops and other officials have their own interests to think of. One longs for the grand old preachers of Nonconformity to be alive today! They were men who feared only God. Men of piety they were, who stood out for justice and righteousness in days of cruelty, oppression and lust. We have no such men to-day. Now I would have you consider what it means for these standard-bearers to have had such forces against them. It means that cruelties and atrocities have been perpetrated that would be a disgrace to any Christian community. I will not enter into detail. I will not speak of what feeding by force means in its cruelty, nor of the cruelty involved by slowly torturing women to death by the process legalised by the recent Act of Parliament. Least of all will I speak of the species of argument used to defend it. But I will say one thing. If John Bright were alive to-day he would denounce these atrocities in the name of God, and make our land ring from end to end in condemnation of the perpetrators, rousing the conscience of our democracy as it has never been roused before. I will say another thing. Let a woman die under this process of slow death-torture and the verdict of posterity will be that she has been murdered and assassinated, and that her murderers and assassins have been traitors to the liberty of our great democracy. I would say a word or two to these great standard-bearers themselves. In the first place, all you have suffered and are suffering has taught you valuable lessons which you could learn in no other way. You have been taught the workings of our political parties, and you know now how to take the measure of our political men, and how much value to attach to their utterances. You have ben taught the workings of the Press, and you know enough of it not to be deceived by it in the future, whatever you may have been in the past. You have been taught many things besides. You know, for instance, the methods by which the police are governed, how justice is administered in our courts, and the way prisoners are treated in their prisons. All these things you know now. It is important you should, as you will be called upon to reform the institutions to which they relate. But you would never have believed the things you now know from mere hearsay. You have learned them from experience , and you are not likely to forget them. Next never forget what the verdict of posterity will be on all this. You are passing through great and wonderful times, and your names will live long on the page of history as the violent who took the kingdom by force, as the drivers-out of its corruption, and as those who, at so infinite and great a cost to themselves, brought the new regenerating power into the world of social and political life. The world does not know yet, but it will then, and then your names will be on the lips of its children’s children through all the ages. Lastly, I would say that even you standard-bearers are far from knowing as yet the real greatness of the work you are doing. You are too much engaged in fighting the actual battle to have time to think of the spiritual value of the sacrifice you make. Some day you will. But it will never be until the day when you will have passed beyond the veil and passed into the Presence of the Great Unseen. One of you has already passed there, though her spirit is with you still. She knows fully now the greatness of it all, and in her own last words I would say to you, “Fight on. God will give the victory! By the late 19th Century, women were beginning to take up bell ringing, able to do so because ringing is quite a dynastic enterprise and also because of the likes of those clergy represented above. It was in 1896 that Miss Alice White (of Basingstoke) was the first woman to complete a full peal. Of the two “elite” and historic ringing societies the SRCY and the ASCY, it was the former who first admitted a woman, Mrs. George Williams to join their ranks in 1898. Extraordinarily it wasn’t until 1998 that the ASCY followed suit! Needless to say belfries throughout the world could not thrive as they do without an equal input, indeed in some belfries our own included, men are in the minority. Nevertheless, my usual entreaty to come and learn to ring bells is aimed at everyone! . It doesn’t seem possible, but the 1st World War will end 100 years ago this year. This thought was in my mind when we rang in the New Year, all those Ryburgh men and yet still so many more never to return in the coming year. How fortunate we are today to be able to have the freedom to do such a thing. The 8 new bells with a 6 cwt. Tenor travelled from Taylor’s Foundry in Loughborough on the back of two WW1 lorries (a Thornycroft and a Dennis which both saw service during the War) for part of their journey and were dedicated at the church of St George in Ieper at the end of August. They were blessed at a special service on October 22nd when they rang out for the first time. This was the culmination of the efforts of the Bells for the St George’s Ypres project, its trustees, and supporters — in particular Alan Regin, Steward of the Rolls of Honour of the Central Council of Church Bell Ringers (CCCBR). Alan has rung in two of our peals at Ryburgh and we would very much like to wish him many congratulations on his award of the M.B.E. in the New Year’s Honours’ List for his "services to campanology and its heritage". We look forward to welcoming him back again to participate in one of the 12 Commemorations that will take place this year which resume with the Spring Offensive on the Somme and first claimed the life of Albert Fox Codling in March 1918. Further abroad in Norwich, but still pertinent to our WW1 peal series, St Peter Mancroft have finally begun their major restoration of the tower which will see them ringing higher up the tower at the level when their most historic ringing achievements were made. The space below which they will vacate is to be turned into a training belfry with a ring of purpose built simulators. This will allow training and ringing to take place at any time of the day or night with out having to abide by the conditions that understandably prevail between the work of the church and that of the Forum which is in such close proximity. In the nature of such things the project had been aimed at reopening in 2015 to coincide with the 300th anniversary of the very first peal in English ringing which took place in the Mancroft tower. The main thing is that it is happening now.